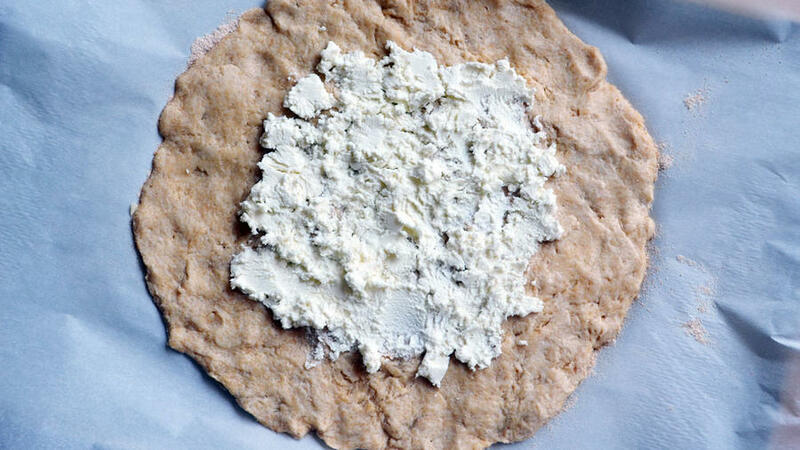 Dough slathered in goat cheese: the first clue that this just might be a tasty dish. Senior Web Editor Jessica Mordo, a seasoned cook but ginger baker, married garden-fresh veggies and baking precision with the Savory Summer Galette. I love to cook, but baking tends to intimidate me—the precision, the science of it. Sure, I’ll whip up the occasional batch of cookies with my daughter, but that’s where it ends. When I’m in the kitchen, I crave creativity and some measure of improvisation. Yet my reluctance to bake doesn’t prevent me from staring wistfully at my French sister-in-law as she bakes dishes from scratch without ever glancing at a recipe. Tarte tatin? Quiche? No problem…for her, at least. A few years back I attempted homemade pizza dough, and the result, even when baked, was an unfortunate gooey mess. That kind of scared me off from messing around with dough for a while! I always tell myself that perhaps one day I’ll take a stab at that kind of food project, but I never get around to it. This round of Cookbook Club motivated me to finally get on board with baking. A savory galette recipe was the ideal candidate, as it’s a hybrid: Part of it entails cooking fresh produce on the stovetop, and the rest involves making and baking dough from scratch. Game on! What was it like to make the dish? Surprisingly easy and fun! First, the ingredients were a dream. I didn’t grow any of my own, but I picked cherry tomatoes off the vine from the Sunset Test Garden moments before tossing them into a pan with olive oil and onions. It doesn’t get fresher than that. I wound up with more veggie filling than the dough could contain, so I reserved the extra for additional topping. Second, the dough came together better than I’d expected. I was nervous about it beforehand, but following the recipe closely gave me the training wheels I needed. Mixing it was almost like rolling Play-Doh, something I’m no stranger to these days with two little ones. Making pleats in the dough while folding: surprisingly fun. Delicious, although I’d make one tweak. I followed the recipe to a T, so I didn’t season the veggies in the pan—they could’ve used some salt and pepper (duh, should’ve known better). Brushed with an egg-yolk wash, the galette is ready for the oven. Will I make this dish again? Yes! It’s a little too involved for a weeknight meal, but it would be a great dish to serve at a summer brunch, along with a green salad. Preheat the oven to 400° F (205° C). Make the filling: Heat the oil in a medium pan over medium-high heat. Add the onion and sauté until it starts to brown, about 3 minutes. Add the tomatoes and cook until they begin to burst, 10 to 13 minutes. Add the squash and cook for 3 minutes, then add the corn and cook for 1 minute more. Set aside. Make the crust: Sift together the flours and stir in the salt. Cut the butter into small pieces and rub it into the flour until the mixture resembles coarse meal. (This can be done by hand or in a food processor.) Slowly stir in up to 1/2 cup (120 ml) ice water, until the dough comes together. Roll out the dough on a floured surface until dough is about 1/2 inch (6 mm) thick and 14 inches (35.5 cm) in diameter. Gently transfer the round to a parchment-lined baking sheet, or to a baking stone. Spread half the goat cheese in the center of the dough, leaving about 4 inches (10 cm) of dough around the perimeter. Pour the vegetable mixture on top of the cheese and dot with the remaining cheese. Fold the edges of the dough over the vegetables a little at a time, pinching the dough together to form pleats. The dough should cover the outer vegetables, leaving the center exposed. Whisk the egg yolk with 1 teaspoon water. Brush the outside of the pastry with the egg wash.
Bake for 30 to 40 minutes, until the crust is golden and the cheese has softened. Let cool slightly before cutting. Serve hot, warm, or at room temperature.Excerpted from Homegrown by Heather Hardison (Stewart, Tabori, & Chang, 2015).